Bow/Stern tie downs..... ratchet straps a good idea vs. Rope? Yes, a good idea to have them, but since we’re just trying to make sure they don’t launch off the car, what’s the best set up? Wat vessel are you using this on? Very easy to make a bow/stern too tight, which could cause your vessel to bow. Usually rope does just fine, and is less likely to be made too tight. Never use ratchet straps ! Prior to purchasing a set of the Thule QuickDraw style, I always just used rope. You should know a small subset of useful knots anyway. This is a good place to hone your skills. @JohnGoldhurst @Sparky961 , yes exactly what I was looking at. Not actual Ratchet Straps, but the Ratcheting Tie Down Systems offered by Thule, Malone or Yakima. Wondered if when going over bumps would the ratchet system on these tie down keep tightening, and if a simply rope would do better... but most seem to go with these, so maybe they work just fine? Once set, the Thule QuickDraw stays in place. Doesn't tighten or loosen. A secure and efficient tie-down system. I have a Yakima one that uses the same cams as their regular straps . Agreed, they stay put. Of course, as with just about any material, they will get tighter and looser with moisture but you'll have to live with that. I go one step further and trim them so that there's only about 2' or so of tail left when I'm done tightening. This way you don't have to worry as much about a dangling end getting caught under a wheel and ripping the bow off your kayak. I'd use ropes almost as quickly though. Whenever I carried 3 boats (a rare thing) I'd use ropes for one of them because I only have two pair of the QuickDraw gizmos. Tying up a pre-made length designed for the purpose was just about as easy. I'm guessing you aren't proficient yet with knots if you're asking this question. Stay away from the stiff yellow stuff if you want your knots to hold. Something like static climbing line will tie and hold much nicer. I'm sure we can get into the knotty details if you decide against the Thule widgets. ... Is THE MOST dangerous time of year for paddling. Never used anything but rope for bow and stern. Trucker's hitch to get it snug - just snug. You can get too much tension with a trucker's hitch just as easy as you can with cam straps or ratchet straps. It will not loosen if you tie it right. Use dacron cord. Nylon stretches when wet - dacron does not. Thanks. Hope I remember how to paddle it once the snow and ice melt, which might not be until May given recent weather. Good suggestion from Steve-in-Idaho. Dacron is more UV resistant than nylon and I try to look for that fiber in any gear that I'm going to be using outdoors a lot. I like the cammed braided cord devices with hooked ends too, like the Thule Quickdraw, though mine are different brands. 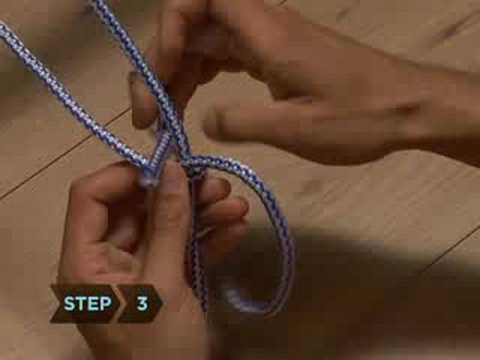 I tie off the long loose ends around the tightened line with a half dozen or more stacked half hitches so they don't whip around -- these stacked knots can also be slid to re-tension the slack, like a prusik knot. I don't rely only on the cams alone to hold -- my cords are long enough that I can double them through the vehicle and boat attachment points to provide a backup if the cams fail. If I'm going to be traveling at some speed, rainy and/or windy weather, I pull over within the first couple of miles to check all the straps and bow/stern lines and re-tighten if needed. Half hitches are my friend, followed by bowlines. More important than rope vs. strap is the question of where you attach to the car. Modern cars don't have good attachment points, so tie down kits (the ones that come with the foam blocks) give you hooks. The idea is that you reach under the bumper and snag the hook on something. This is a bad idea because you will be hooking onto plastic, which can flex and drop the hook. When this happens, your rope or strap may get pulled under the wheel, which will jerk it tight and damage your boat. So the best approach for today's cars is to open your hood, find a bolt along each side (as far forward as possible), and install a webbing loop there. This is very easy to do. You take about 10 inches of nylon/polyester/polypropylene webbing, fold it double, and melt a hole through both thicknesses at the end opposite the loop you have made, Then you remove the bolt, put it through the webbing, and reinstall it. These loops (one on each side) are stored under the hood when not in use, then flipped out when needed. The beauty of this system is that your rope or strap will not be long enough to reach under the wheel if it comes loose. The only drawback is that you may have to replace the loop after a few years if the heat of the engine compartment weakens it. At the rear of the car, you may not have any accessible bolts, but you can do something similar by tying a webbing loop around trunk hinges or latches, so that a bit of the loop hangs out when you close the trunk/hatch/tailgate. I'll add that for the trunk I've often just looped around a large object (like a 2x4), closed the hatch/trunk almost all the way, pulled it tight, then closed it completely. This works in a pinch when there are no obvious places to attach it. A similar method can be used (or purchased) for use under the hood, though the "stopper item" needs to be smaller. Someone else can provide the link for the purchasable item if they feel so inclined. Huh. My last post looks like I'm making an admonishment. I meant to say, "I never used anything but rope..."
I like to put a grommet on those hood loops. You can usually find grommet kits, along with the web strap, at your local outdoor supplier. I use a hot nail for the hole. Yes, I have the grommet hood loops ordered to be attached by a bolt under the hood, and just ordered those quick loops with the black hose attached that squishes down under a trunk lid. I have a trailer for getting my kayaks back and forth, but looking for the best options for using car “b” to get my yams back to paling “a” after going down river, back to the trailer. I use friction straps for short trips but I always make sure I have bow and stern tied down with good rope and well-tied knots on longer trips. I led trips and/or worked trip logistics for many years in the past and transported canoes for hundreds if not thousands of miles and never had a rope or knot fail...I did however have a canoe fly once that was tied with two ratchet straps. I've never made that mistake again. Just a dumb trick for a canoe - when I have the darned chance to tale out the Merlin and prove how lousy a canoeist I am, I set the boat up with at least one thwart directly over a cross bar. Then I run a strap around the the thwart and cross bar underneath. I usually use a long enough red strap that I can daisy chain it out back and have it be my flag and backup check. I started doing this because I didn't have the chucks to limit side movement. But after seeing a canoe going down the highway in Maine with its skin being torn off by the wind because the bow had been a bit lifted, I feel much better with the structure itself strapped to the rack. The car was going north when I was going south, so I couldn't do anything to warn them. The good news was that the blowing mass of material was obvious to drivers behind them, so when it let go it was not likely to cause an accident. As to hood loops, I just tied off some rope from some metal supporting the hood and front quarters that goes out the front under the hood. If you go from the front of the hood, the rope may still rub on the paint. Most folks find some bolt along the sides of the hood to attach webbing to. That way there is no direct contact with the paint by tie down ropes. My paddling vehicle doesn't worry about a rub. @yknpdlr I and my husband, then I, have used hood loops made of rope since approximately 2002 thru 6 cars. 3 Ford/Mercury wagons, one Subaru and two Toyotas. Never had the issue you name. And the side positions, which I have used at times in 2 of those cars because of the hood configuration, also rub on the edge of the hood. Just a different edge. Celia, When I first started carrying a canoe on a vehicle, I had an AMC Hornet as my first vehicle. Not knowing any better, I attached ropes under the front bumper which ran up over the hood and rubbed on the hood as they held the canoe down. I had to tie an old rag to the rope where it rubbed to preserve the paint. More recently, my vehicles have been Subarus. There is an accessible bolt about mid-way back from the front on each side of the engine compartment under the hood. I fasten loops of webbing to these bolts and pass them up through the small gap between the hood and the fender when the hood is closed. A single rope is connected to each web loop and secured to the canoe under slight tension with a truckers hitch. There is no way for the webbing or tie-down rope to rub on anything in that configuration. When not in use the webbing loops rest inside the engine compartment out of sight under the closed hood. More recently, my vehicles have been Subarus. There is an accessible bolt about mid-way back from the front on each side of the engine compartment under the hood. I fasten loops of webbing to these bolts and pass them up through the small gap between the hood and the fender when the hood is closed. I too have a Subaru and do the same as yknpdlr to fasten the bow tie-down to my kayaks. However I also put plastic tubing around the webbing, mostly to protect the webbing and (maybe) paint. @yknpdlr I know the bolt you are talking about, on the Subaru. And I went somewhat from the side on my last Rav4 as well because of the hood shape and where I had a nice frame element, Unless the strap you are using is so thin as to never encounter an edge of the hood when you are traveling, when things are moving a bit, it does touch the edge of the hood under pressure. The straps or ropes I am comfortable relying on do. My big annual trip is about 6 hours of driving time mostly highways. I/we only went from under the front bumper twice. Coming home the second time the line, long enough to get into the wheel well if it happened just right, came loose. Pulled over fast so no problem but we got the message. Have since always run from a frame element just under the hood, and the only part of the hood it touches is the edge. I don't doubt that the Hornet had a vulnerable paint surface, and others out there may. I remember the Hornets and other AMC cars, though I never had one myself. It is just not an issue I have had. In 2017 I drove from northern NY state to Whitehorse and Dawson City, Yukon and returned. I had a 23' C4 canoe on top of my Forester. The webbing straps attached to a rope to hold down the bow came through the gap between the hood and the fender and neither webbing nor rope ever touched any painted surface. Sorry no front view photos. @yknpdlr Your gap must have been bigger than mine have been. I use these with some rope and a taut line knot as mentioned above. Works great and doesn't matter what vehicle you drive. Might I offer you a look at the hood loop system mentioned above: Go to my website:https://tomoutdoors.com/outdoor-tips/ and scroll down to the article on nylon strap installation. I've had loops on my van for over 10 years and they are still in great shape, haven't lost a boat yet, either. Last year I tried moving my bow/stern lines back to the crossbars on the roof rack. My theory was that this was even better at keeping the boats secure from fore/aft shifts, especially if one of the straps around the hull failed. But now that spring is around the corner I'm wondering if this is a good idea. The configuration described above does not provide any downward force, but is that the purpose of the bow/stern straps? Try for the most possible redundancy. Go through your straps and imagine each one failing independently. Do the others provide enough support if one fails? However unlikely, what about two failing? What if your rack comes loose from the car? Also very unlikely (if properly installed!) but I've been around long enough not to quickly dismiss possibilities. Ideally you don't want to have all your straps/ropes attached only to the rack. Having some attached directly to the vehicle adds valuable redundancy. The main purpose of fore/aft straps on long boats is to keep the bow from lifting at highway speeds and/or strong wind gusts. This force can be quite strong at times and essentially wants to "pull" the rack off the car vertically. The bow sticking out front of your vehicle has a lot of leverage under those conditions. This is especially important when the cradles aren't spaced very far apart - which is limited by your vehicle and rack design. Similarly, on bumpy roads the bow/stern tie-downs limit the amount of "rocking" that occurs, which can set up damaging momentum in extreme cases. The way you describe, you are indeed countering the movement fore/aft, but have nothing to deal with most of what I've described. If your setup is particularly prone to (or you're just worried about) the boat sliding, instead of relocating the straps just add another pair that goes to a point as directly below the bow and stern attachment points as possible. When roof topping with J-cradles, I try to cross the straps so that there is also some force pulling the boat against the cradle. So the passenger side bow strap, for example, would be attached somewhere near the bumper on the driver's side and vice-versa. Loops that go under your hood are a good idea here, as they also limit the length of strap/rope required to a length that won't get caught under a tire if it comes loose.